The market share of the tablet PC for kids begin to form when the tablet market is beginning to fill. As a user, kids begin to learn to recognize and use the tablet. If they already have early and get used to using a tablet with a particular brand, then when at the age of adolescence and adulthood, the brand will be "embedded" in their memory. The kids were also early users of the tablet. Furthermore, they will also grow into adolescence and become part of the market for a tablet that is designed for teenagers. When mature, they will also be part of the tablet market. Manufacturers are supposed to take advantage of this market intelligently, to instill fanatical about their products. Since the tablet will become a necessity of modern life. Children are ongoing tablet users, they will be a tablet user for a lifetime. 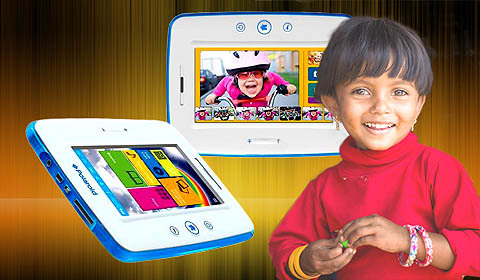 A company known through its instant camera, Polaroid, also enter the tablet market for kids by launching PTAB750. The tablet uses the Android platform 4.0 Ice Cream Sandwich, is designed with a 7-inch screen and has a resolution of 800 x 480 pixels. Like most tablet for kids, designed with sturdy PTAB750 and on each side is coated with rubber pads to protect from impact. The color is a combination of blue and white, is quite striking but not too tacky. Meanwhile, to protect kids, Polaroid PTAB750 comes with Parental Controls, which serves to control the applications that can be chosen by the parents to use kids. Parents can select content from the application through the Free Play, so Polaroid PTAB750 will only display content and applications that are suitable for children. This feature makes PTAB750 can reach a pretty diverse age range of users. The tablet is equipped with over 35 full-version applications, some applications are MusicStudio, Draw, Kids Cam, and KidsVids. Polaroid PTAB750 can meet kid's needs more, because it uses a Cortex A8 1 GHz processor and 512 MB RAM. Equipped with 2 MP rear camera and have an internal storage space of 8 GB of space, was added to the SD memory card expansion slot. Android Tablet For Kids made Polaroid was sold at a price range of U.S. $ 149.99. Fairly inexpensive and innovative, this is evidenced by an award from the CES Innovations 2013 Design and Engineering Awards Honore.